Herbert Belleau was born on Dec. 9, 1919, to Edless Belleau and Adia Darbonne Belleau in the community of Swords, Louisiana. 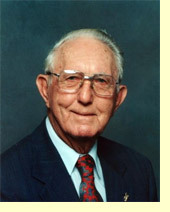 He attended Eunice High School and graduated as Valedictorian in 1938. In 1941, he married his high school sweetheart, the former Marjorie Moreau. At this time, he was buying sweet potatoes in the area for the Dupuis Produce Company. All his contacts were with French speaking Cajuns. On September 13, 1943, he joined the U.S. Army. After a few months, he was sent to Italy, where he served until December 1945. During this time, he earned a Purple Heart and the Bronze Star. He was with the 5th Army, 34th Division, until the spring of 1945 when he was transferred to Allied Force Headquarters. From there, he was sent home and discharged in December, 1945. On his return, he was employed by Production Credit Association of Opelousas as an inspector. Again, the majority of his customers spoke only French. After 33 years in that job, he retired as Vice President and manager of St. Landry Parish. When CODOFIL was organized, in 1965, he was active in entertaining French and Belgium visitors and was called often to meet with them and to talk about the Cajun culture. On December 23, 1975, he was cited for taking part in a radio program in Baton Rouge with French reporters. The St. Landry Parish Farm Bureau awarded him the distinguished Service Award for Community Service in 1979. France Louisiane recognized Herbert in July, 1985, for his exceptional contribution to the French Renaissance movement in Louisiana. In the early 80’s, he began a two-hour, all French radio program on Saturdays on radio station KSLO in Opelousas. This program lasted for ten years. All commercials and discussions were in French. For the 40th anniversary of D Day, he escorted groups of veterans to the Normandy Invasion area and other points of interest in France and Belgium, doing all the interpreting and arrangements. The CFMA presented him with the Pioneer Award in 1995 for a life dedicated to the promotion of Cajun culture. He was also interviewed on James Fontenot’s PBS French program. He is now serving as a CODOFIL board member.